Around sixty institutions, associations and universities will be in attendance with more than 200 stands and 10 science trucks with fun learning activities for finding out more about science and new technology, while having fun! 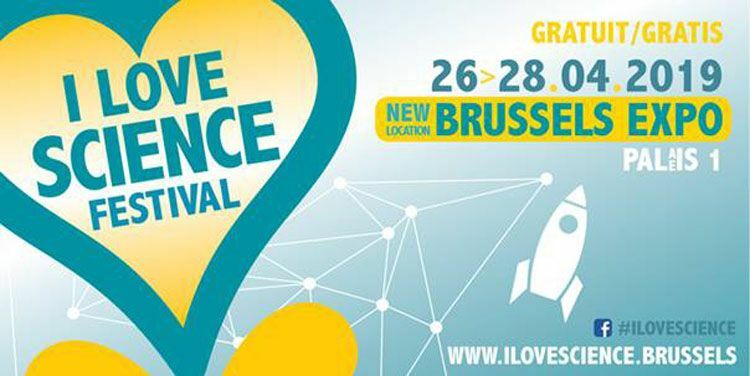 Created in 2018, through the initiative of the Brussels Secretary of State responsible for scientific research and Innoviris, the “I Love Science festival” of science and technology is a free event that is open to everyone. It offers visitors the chance to immerse themselves in the world of science and new technology. The “I Love Science Festival” does not limit itself merely to the observation of scientific discoveries. This event is designed to be both immersive and interactive. Visitors can genuinely take part in the experiences and activities on offer to them, such as observing the stars in a mobile planetarium, discovering the world of insects or even taking a flight in a glider simulator. More than ever, the future of the planet is right at the heart of our concerns. Through interactive activities, multimedia exhibitions or even by presenting new modes of transport that respect the environment, the festival will show the public how technology and science can contribute to improving everyone’s day-to-day life and ensuring a better future for all. Like last year, BOZAR is taking part in the event. Several activities based on the theme of “Speculative Futures” are being showcased at Brussels Expo, Osseghem Park, in the Jette-Ganshoren marsh and at BOZAR. The subject will be ecology and the responses that art and research can bring to environmental problems. The “I Love Science festival” is an invitation to discover science and new technology. A unique opportunity to take a deeper interest in the progress being made in these fields. Patrice Goldberg: author, journalist, screenwriter, director, producer and presenter, chief editor and science manager at the RTBF, Patrice is responsible for the science programme Matière Grise (“Grey Matter”) on channel one. Véronique Dehant: Véronique works at the Belgian Royal Observatory, where she is responsible for the operational management of the “Planetology and Reference Systems”. She is also Adjunct Professor at the Catholic University of Louvain. She has been an academician (member of the Belgian Royal Academy; section for science) since 2010 and a foreign member of the Académie des Sciences in Paris since 2016. Nathan Uyttendaele: Nathan has a real gift for popularising science. Through his YouTube channels under the name “chat sceptique” (“sceptical cat”), he has more than 85,000 subscribers. He has also given a TEDx talk on “the truth about gambling” that has been viewed more than a million times.